Perfect runner rug. Love the design. I like that this rug goes with other rugs in my house. The design is different and it seems that it should be easy to maintain. 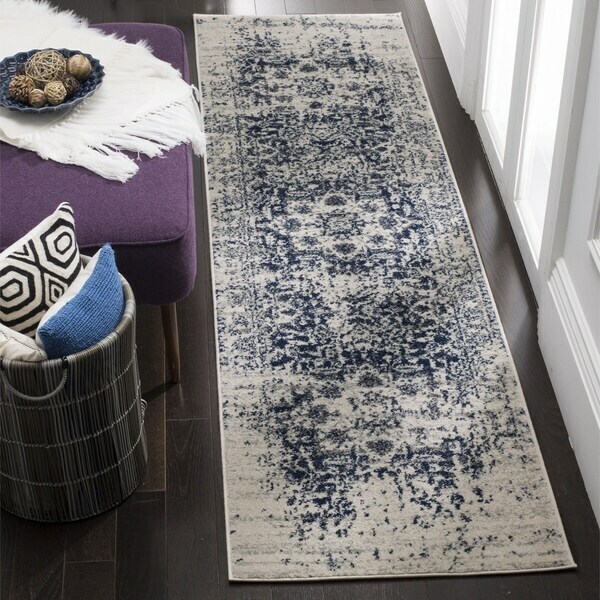 I received the Safavieh Madison Vintage Medallion Cream/Navy Distressed Runner (2' 3 × 6') within the time frame given. I am pleasantly surprised by the quality and richness of runner, especially considering the low cost of it. Love the colors - only Cream and Navy are mentioned, however, there is grey in the rug as well. Looks great! I love this rug! It's perfect for at my back sliding door. The size is accurate and the colors are true to life. When I first unpackaged it, it was "wrinkled" from being rolled, but after a day or so of laying out on the floor it flattened right out. It's in a high traffic area near our island where the kids eat and the door the dog goes in and out of and it has held up beautifully with frequent vacuuming. Beautiful coloring! Cleans up really well also! I would recommend this to anyone wanting to get this rug! Just remember to buy a non slip mat to go under it! This rug was a perfect addition to our dinning room area. Love the colors and the feel of this rug! Love this runner. I also bought the larger size. The colors are great and just what I needed. The thickness is just right. Another great purchase. This rug works and looks great! I love it. I receive so many positive comments about this rug. It was a great purchase! I bought this as an accent rug to go with the Safavieh Madison Bohemian Vintage Cream/ Multi Distressed Rug - 8' x 10', and it looks wonderful against all the colors of my area rug! Great buy together! Matched the bigger rug in the same pattern I purchased. This came on the same date as the big living room rug. I was impressed with the quality. I highly recommend the bob flip rug as the rug is a little on the tin side. It doesn't have loose material and is non shedding than misyvarea rugs. Looks great and standing through heavy traffic. Rug looks exactly as pictured and described. The colors are muted. It will be perfect in an entryway with heavy traffic. Beautiful. I had the area rug an wanted these to match in our new home. Couldn't as for a nicer rug for the price. Thanks Overstock for great items at affordable prices. Will continue using Overstock. True to description. Wears well, no pilling. Only problem is chemical odor used by manufacturer or warehousing is very strong. After 3 months is still detectable. Perfect for my hallway! Cleans easily. Absolutely love these rugs. Everyone comments on how good they look. I love this rug! It’s very soft and looks great with my distressed farmhouse vibe I have going. I would highly recommend this to anyone! I put two of them on both sides of my kitchen farmhouse table and it looks awesome! I love this runner. I have the matching carpet to pair with. The blue is a rich blue color that stands out with the cream. The material does not collect dirt so very easy to maintain. I bought the 9' by 12'. This smaller rug that I am ordering today is for my bathroom. It is absolutely beautiful. !!!! "What is the true length? Is it exactly 72"? I need a rug that is 70"." This rug is approximately 2' 3 x 6' (72 inches). However, please keep in mind that as these rugs are individually made, as such, there may be slight variances in the finished dimensions.